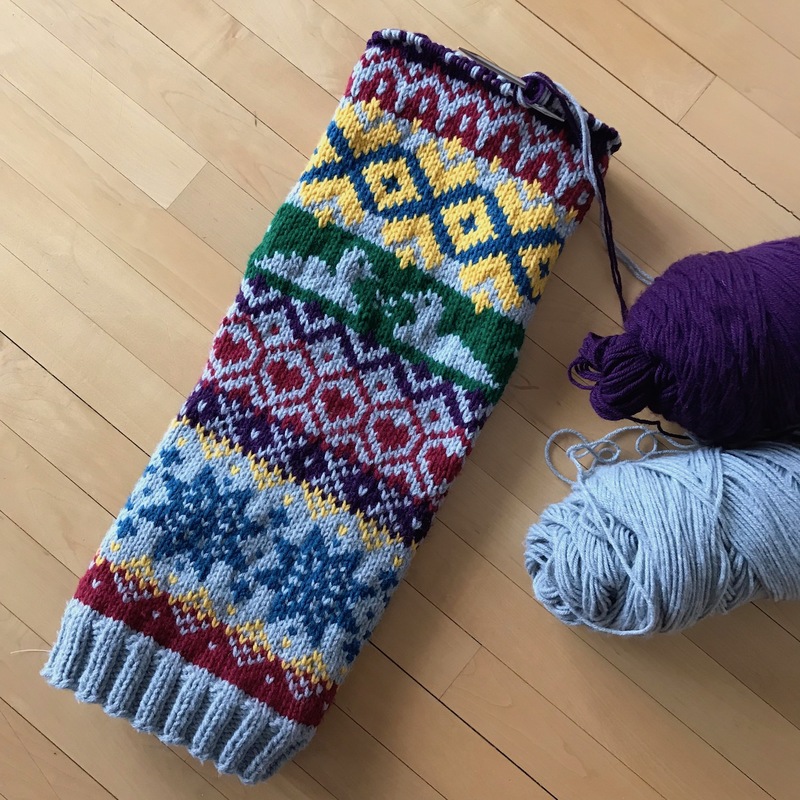 A few weeks ago a group called Saint Paul Cozy put out a call on Ravelry for Minnesota knitters and other fiber artists to create cozies for 158 lampposts in Saint Paul. Well, you know I couldn’t resist. After doing the giant backdrop for the State Fair in a week, I figured this would be a snap. I knew I wanted it to be fair isle like a giant sweater and have a few Minnesota themed things in it. My post is five feet tall and about about halfway done. I’m using Caron One Pound doubled on size 9US needles. I can get about six inches knit in an evening which is pretty good! I probably could have used a bigger needle, but didn’t want any peek-through at all. I can tell you guys, this thing weights a ton compared to my regular knitting. I decided the easiest thing to do would be knit it in the round and steek it, even though I’ve never steeked before. I wanted to steek with my sewing machine, but failed to think about the fact I can’t just run a five foot tube through my machine like that! Also the thickness is a little tricky. I can do a few inches at a time, so that might just have to work. Luckily, the steek does not have to be pretty! 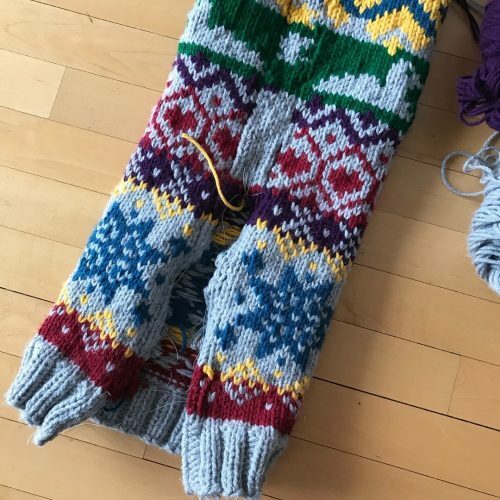 1 year ago by Kat in Knitting , Needlecraft | You can follow any responses to this entry through the RSS feed. You can leave a response, or trackback from your own site. I’ve never tried steeking either, but this lookd doable. P.S. You could then add a button band, as that site shows! Oh no button band! They are just going to zip tie this baby on. What an awesome idea and your knitting is amazing as always!